The City of Spokane will have to pay for six of the 10 additional police officers promised in next year’s budget without the assistance of a federal grant. The Department of Justice announced on Monday recipients of $98 million in grants to pay for new police hires next year. Spokane was not on the list of 179 law enforcement agencies receiving money, despite applying for funds to combat violent crime. The grant, part of the Justice Department’s Community Oriented Policing Services (COPS) program, would have added roughly $360,000 to city coffers next year. Officials said they’d set aside that amount already in the current budget negotiation talks, which have hit a snag over City Council concerns about spending in the Public Works Department. “It’s part of our reserve account, that we had just in case we didn’t get it,” Mayor David Condon said. 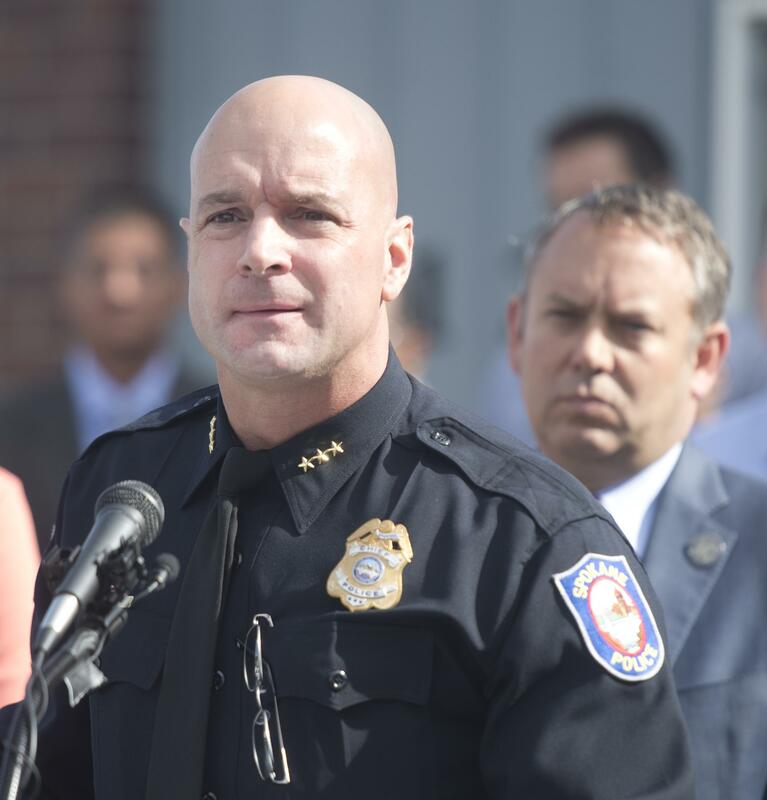 Spokane Police Chief Craig Meidl said he was hopeful the city would receive the grant, given the department’s previous work with the Justice Department on use-of-force and cultural reforms, which ended under the direction of President Donald Trump. “I had hoped we would get it, since we did work with them and they’re aware of Spokane PD, and how much we really go after different programs,” Meidl said. If the officers had been hired under the grant, Meidl said he would have been limited in where he could assign them, given the application the city made for funding. At least two of the new officers likely would have been assigned downtown to cover shifts addressing the late-night bar crowds, he said earlier this fall. While Spokane didn’t receive funding, three Washington state agencies were notified this week they were on the list of accepted applications. Police departments in Federal Way, Moses Lake and Pasco will receive a total of roughly $1.4 million, enough to hire about 11 new officers, according to a Justice Department news release. Lewiston received $250,000, which will be used to hire two new officers for its department. Despite fears Trump would roll back funding for the COPS program, the proposed budget from the White House earlier this year actually increased federal spending on the project 17 percent over this year’s total, to $218 million. The hiring program, specifically, has seen several reductions in funding levels since the recession. Since 1994, the program has been responsible for hiring an additional 129,000 officers to 1,300 law enforcement agencies across the nation, according to the Justice Department. The promised funding this year, $98 million, is down about 18 percent from last year’s spending on the hiring program, which was $119 million. City Council members and the department have been advocating for additional police following the release of a study this summer indicating Spokane needs an additional 44 hires to enable officers to split their time evenly between answering service calls and proactively patrolling neighborhoods. City Councilwoman Lori Kinnear, chair of the city’s Public Safety and Community Health committee overseeing police department operations, said city leaders added a reserve amount early in budget negotiations in case receipt of the grant fell through, and that the new hires would be part of next year’s spending plan. She emphasized that plan is still in flux as the council and administration negotiate the budget’s final details, which must be approved by the end of December under state law. “There’s still a lot of wheeling and dealing that needs to take place,” Kinnear said. Published: Nov. 26, 2017, 6 a.m.